The Palestinian Prisoners’ Society (PPS) has reported that Israeli soldiers invaded, on Tuesday at dawn, several communities in the occupied West Bank, and abducted 29 Palestinians, including two women from Hebron. 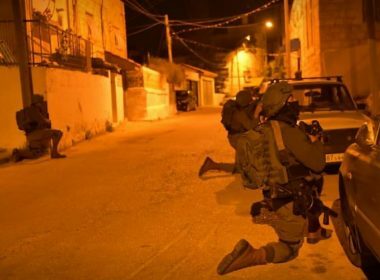 The soldiers conducted extensive and violent searches of homes during the invasions, and interrogated dozens of Palestinians while inspecting their ID cards. The soldiers also installed roadblocks, stopped and searched dozens of cars, and interrogated scores of Palestinians while inspecting their ID cards. Furthermore, the soldiers invaded farmlands, owned by Hashem Mustafa Allan, in the northeastern part of Einabus village, south of Nablus, in northern West Bank, before the military bulldozers uprooted them in preparation for expanding the illegal Yitzhar colony, which was built on private Palestinian lands. Safa’ Jihad Abu al-‘Asal, Jericho. Daoud Khalil Abu Dahouk, Jericho. Mohammad Bilal Abu Bakr, Jenin.